Syncaine asks if we need to come up with different terminology for the full spectrum of MMOs. Currently the term MMO covers a huge range, from ones that don’t require much time to ones that do, and everything in between. Syncaine’s post gives examples from bite-sized 30 minute chunks to “20hrs+, with solid 2-3+ regular hour blocks and being able to play during the prime nights (Tues, Thurs, Sunday), while also being able to schedule to play 3-4+ hours for something major”. Thing is, activities that require 20+ hours a week, blocks during primetime, and scheduling for major events already have a name: part-time jobs. But jobs typically involve salary. So I would suggest calling them: unpaid part-time jobs! I jest, sort of. Syncaine points out Syp doesn’t mention other players, I would point out Syncaine does not mention actually having fun playing in his manner (he does mention that it isn’t fun to solo or be casual in DarkFall). Manning a wall for hours, loss of investment and training after somebody moves on? Hmm… actually sounds more like a seasonal or temporary unpaid part-time job. I read Zubon’s elementalist review over at KTR, and worth a read. Granted, chances you are already reading that site if you are here but just in case. This isn’t specific to LoTRO, but should be of interest. I follow a data visualization blog, and am interested in stats, and found the Lord of the Rings Visualized interesting. The linked site, LoTR Project, is really interesting too! I made it to the Straits of Devastation, and joined in on some zerg action over on the western half of the map. 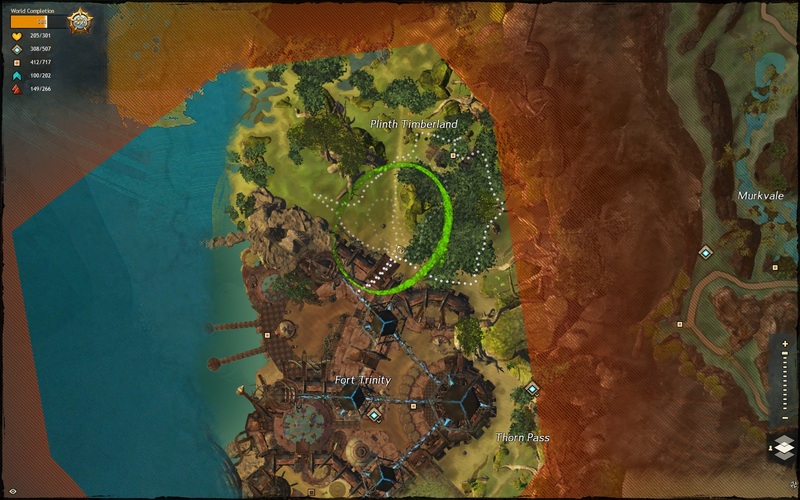 It was a lot of fun and the best way to explore the map – I picked off nearby skill challenges (most were of the “commune with this place of power” variety) and discovered points of interest. I’m even getting better at juggling attunements: I typically start with earth and put down an Eruption, to get some bleeding going. Then I’ll switch to fire and follow up with Meteor Shower and Lava Font. Finally, I switch to water and cast Healing Rain and Geyser, to help heal the front line fighters. 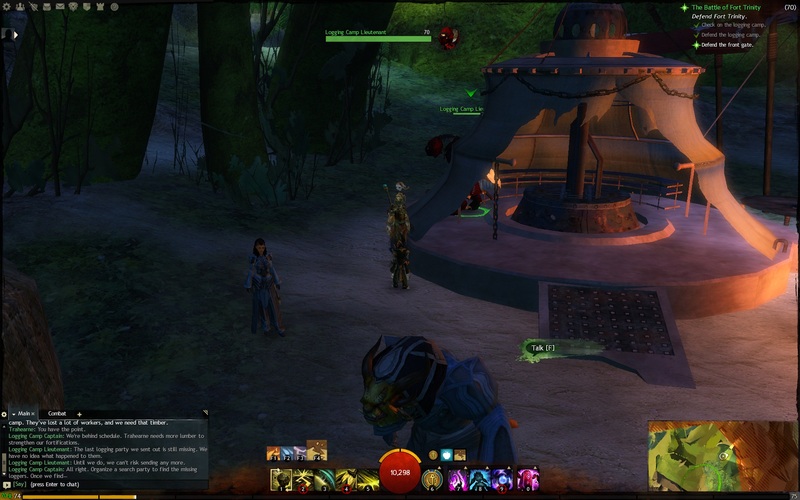 The interesting thing I notice about GW2 and my characters, is that I’m minimally attached to them. In others MMOs, I play very carefully, because I hate dying. Even though death penalties are generally light these days, I just really hate defeat so I setup fights, use my skills, draw mobs carefully, and so on. But not in this game. 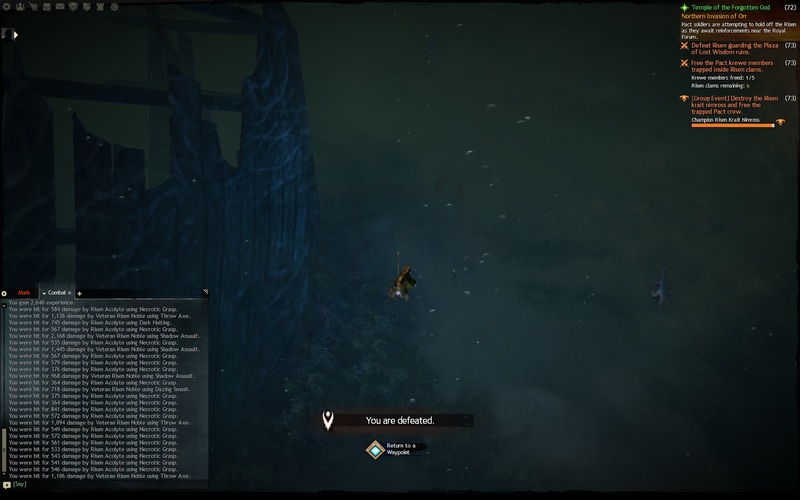 Death in GW2 comes so often, so unexpectably, and so unavoidably, I just don’t care. I’m not seeking it out, nor do I play recklessly (i.e. 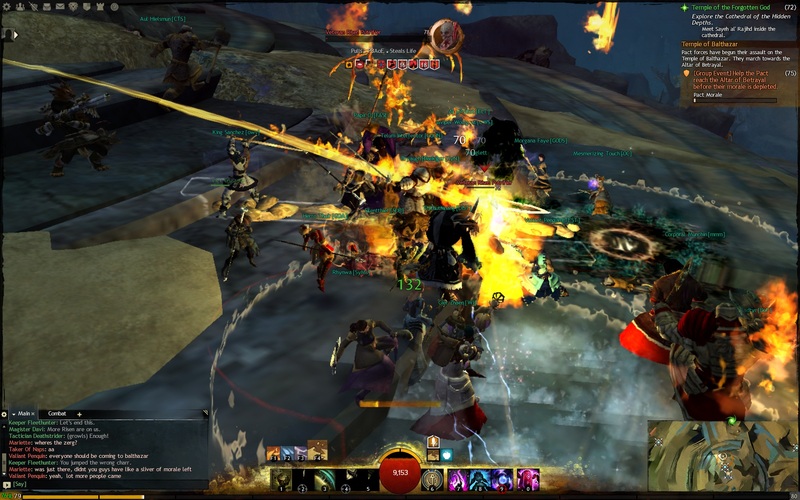 charging solo into a large group), but when a mis-timed jump while trying for a vista can lead to a falling death, when Champion-level mobs can one-hit me, when turning the corner into a new area might result in a 2 second death from a half dozen mobs simultaneously attacking, when many fights in the storyline missions are “balanced” for a group, I’ve just learned to view death as a break to sell junk to the merchant. No matter how carefully I play, I’m reminded fairly regularly that it doesn’t matter and my char will die. Especially since up until recently I was having video issues that forced random 5 second breaks on me (hopefully resolved, see below). I’m removed from and can’t get as immersed into my character due to being destroyed on a regular basis. In fact, I change my playstyle knowing this. When fighting multiple mobs (i.e. you are in a storyline and can’t avoid it) I’ll use AoE skills (obviously!) and start tabbing around to find the lowest health mob when I’m also low on health. The reason is – the low health mob is the one I can most likely finish off with my downed state skills, giving my a Rally. Normally you are best off concentrating on one mob of a group, in order to reduce the numbers. 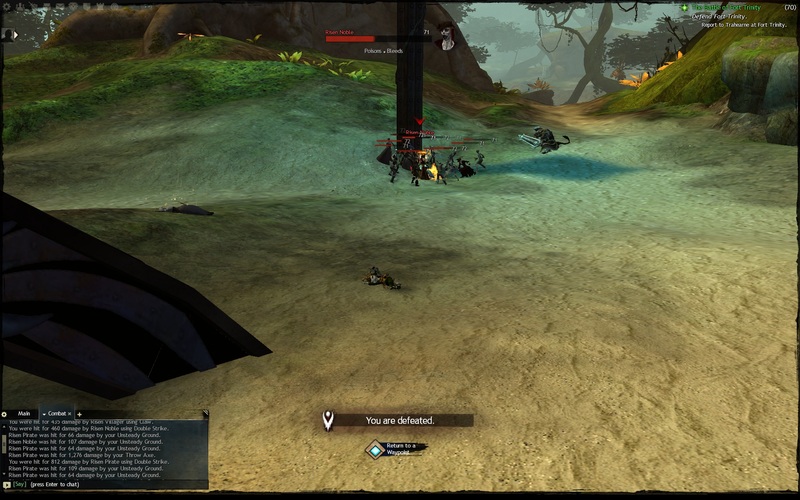 But in GW2, it is better to tab-locate the mob nearest death when it happens to you. I’m not embarrassed to admit I’ve survived several group fights with a combinations of bleed stacking and finishing off enemies from a downed state. It’s ugly but that’s dealing with GW2 group fights. P.S. The screenshots may look a bit grainy. I finally turned all graphics settings as low as possible to see if that stopped the video crashes. So far is has noticeably reduced the number of crashed I suffer, so I’ll put up with the bad looking graphics. I’ve been pleasantly surprised by recent storyline missions, particularly “Retribution”. That’s where you defend Claw Island against a dragon attack, so it is dramatic and relatively fun. The last time I had a mission in Claw Island I thought it wasn’t well paced: lots of downtime and running back and forth, ridiculous fight odds (6+ on one, with only one NPC helping you and they seemed distracted half the time). This one went much better because you had an actual team of several NPCs accompanying you around, making the fights tough but reasonably fair. But, I ran into a glitch while defending Fort Trinity… as in, the enemy waves quit coming. After waiting several minutes with nothing to fight, I got bored and wandered around, looking to see if there was a mob stuck on a plant or something. And I despaired, guessing that this guy was supposed to follow me back to the fort entrance and participate. Him being stuck in this tent probably caused the mission to stop midway through. So, I gave up waiting and quit the game (to the desktop). I logged back in thinking I’d just hop back in the mission and redo it. Normally I log off at a waypoint, which seem to be “safe” from attack. I’m sure they aren’t but my experience is that mobs stop chasing you near a waypoint, so there is a little “clear” zone around them. Except this time I didn’t log off at a waypoint, since my mission glitched and I couldn’t advance. I was near the floating green star of a storyline mission, in the wilderness (well, just outside Fort Trinity but in a combat zone). Oh no, I didn’t log back into a safe area at all, I apparently logged back into some kind of dynamic event involving an attack on the fort… and got mobbed by literally a dozen Risen that chopped me to pieces in seconds. I Rallied somehow but was dropped again immediately after the brief invulnerability wore off. See that big cluster of Risen? I logged in right next to them and they slaughtered me, then moved to fight some NPCs. Yeah, that was awesome. So I called it a night, very frustrated after having lost progress in a storyline mission due to glitch, only to log back in to my own massacre. I leveled as a fire mage for ~25 levels, switched to air for another ~25 levels, and got around to trying earth. It took a bit to grow on me, but now I play as an earth mage, speccing to grandmaster in Earth and also in Arcana. My preferred weapon is the staff. It’s two-handed, so eventually when I try for fancy cultural weapons or legendary ones, it’ll be half the cost of buying/making a main-hand and off-hand item. That is a lesser concern… I settled on staff because across all elements, it has the greatest number of skills I like. This is important because elementalists can’t switch weapons in combat! Annoying, and I thought this was a bug for sure – originally I swear the character sheet let me load up a swap set, but now it doesn’t and I have no screenshots to show otherwise – but after digging around, it seems that both elementalists and engineers can’t weapon swap in combat because those classes have something else instead: attunement swapping (for eles) or kit/belt swapping (for engineers). I’m not sure it is a perfect substitute but whatever. As for staves, Fire has its impressive Meteor Shower; Air has Chain Lightning (good for hitting 3 foes, although sometimes this draws an extra add into the fight), Gust (interrupt/push back) and Lightning Surge (blind); Water has lots of healing with Water Blast, Geyser, and Healing Rain; Earth doesn’t have flashy effects but it does do great damage with bleeds from Eruption and Shockwave. I love watching the damage number “erupting” from the mob like a tiny volcano. The bonus toughness helps (just a general sense, I didn’t do comparative tests) too. My playstyle doesn’t involve too many attunement swaps – generally in a group event I’ll start out trying to stack bleeds and then switch to Water to lay down a regeneration circle or two. It’s fun and I feel useful, hanging towards the back and helping pick off adds and rez others. I advanced my elementalist to Sparkfly Fen, which features the world boss Tequatl the Sunless, an undead dragon. Periodically I’d see other players ask for an estimated time to the next appearance… and my interest was piqued. 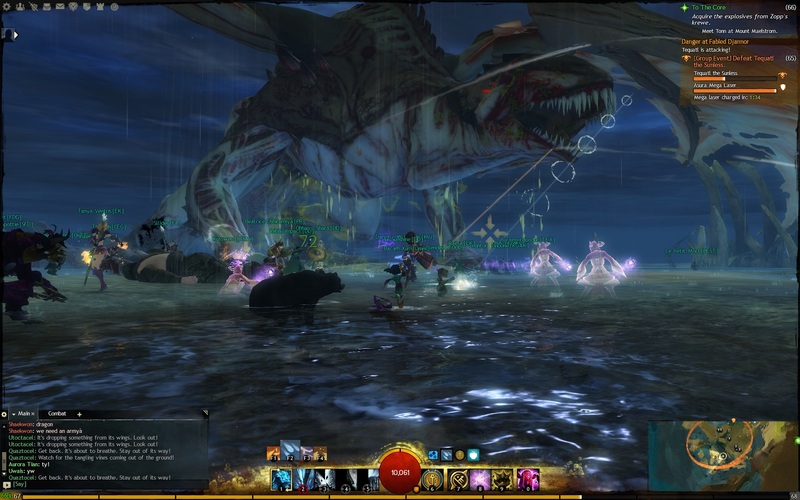 Eventually I was on and ready when Tequatl appeared, so I zipped over to the Splintered Coast Waypoint and joined in. While waiting for cooldowns on my skills, I switched over the Water attunement and started healing. Well, providing regeneration as best I could, and lingering in the back and helping to rez others. I had fun in a mixed role of dealing some damage to Tequatl, fighting occasional groups in the back, healing/regenerating, and rezzing. Eventually we drove off the dragon and everybody rushed to the giant chest that appeared. The loot was mostly items I couldn’t use, so I checked what each sold for on the Trading Post before vendoring. But the loot wasn’t the highlight – the event itself was a fun time! 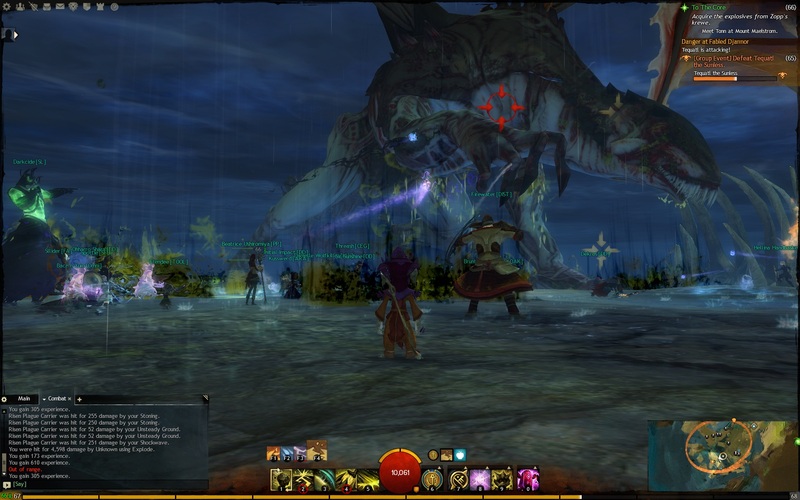 Author mmojugglerPosted on 2012/10/10 2012/10/11 Categories Guild Wars 2Leave a comment on GW2 – Dragon Fight! The good news is dialing down the graphics options to low has helped stability quite a bit – I’ve only crashed 3 times in the last ~7.5 hours of play. It is still annoying, but about half as often as it used to occur. I’ll take what I can get, and keep an eye out for newer nVidia drivers. 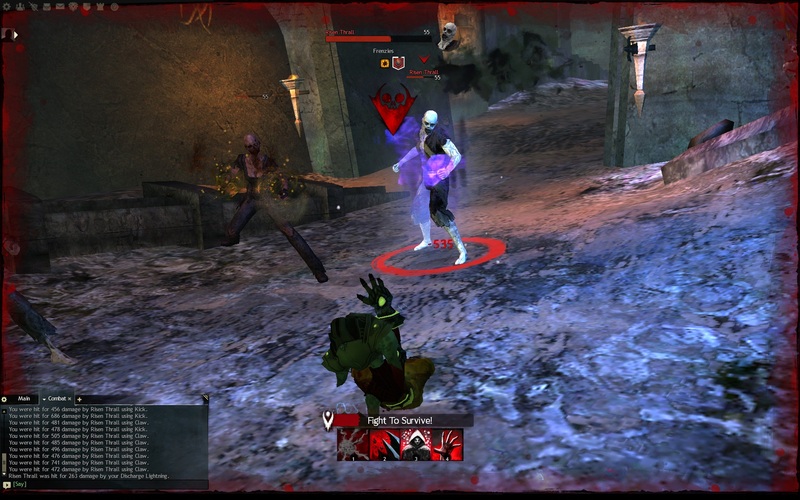 The bad is the GW2 storyline – I did a few more missions, to “catch up” to my level, and the last one was visiting Orr in a dream, “A Light in the Dark”, and it was tedious and not all that fun. I mentioned this before, but the pacing for the storyline missions is way off. Before “A Light in the Dark”, there were a few short missions: meet some people, adventure into a small cave, fight a handful of mobs, pick up the gizmo. Next up was: test the gizmo against mobs. Total time, probably 10 minutes each. Then, “A Light in the Dark”. I’ll try not to spoil it too much, but this mission went on forever: follow your companion wandering around; 4 or 5 times fight a group of 2 or 3 tough mobs, pick up some more people, fight a giant battle against 2 veteran mobs plus dozens of lesser mobs (this took 5-10 minutes of fighting), follow companion around again and once more battle 1 or 2 mobs at a time for another 4 or 5 time, enter city, get jumped a group of 3 mobs (see above pic of one of many deaths) repeat about 3 times, fight a special boss thingy, cutscene with NPC you talk to, exit the city and fight more tough mobs another 4 or 5 times, then FINALLY take on the end boss. I don’t know what it is like for heavy armor wearers, but for a lightly armored elementalist, who does decent damage but not that spectacular against equal leveled enemies, every fight turns into a kiting charade since I can’t take lots of direct hits. It feels extremely tedious when at least 50% of the storyline content is filler fights that serve minimal expository purpose. Plus, the fight balance is still terrible. The pic above when I suffered a defeat (one of several), occurred very quickly – 3 mobs, getting a single attack in each on me, hit for about 20% of my total health. I do not kill them back anywhere near as fast, so those group were whittled down (usually) attrition style: 2 of their deaths (on average) to 1 of mine (since your companion does fight a little bit). The final boss has an interrupt stomp that hits for a solid 15% of my health, and left me knocked down so most of the time I suffered his followup hit for another 10% health. Once again, running in circles, backing up, healing on cooldown… getting stuck on the damn geometry of the staircase the fight is near (ARGH!). I can power through but it doesn’t feel fun at all, just an annoyance to suffer through to see more of the story. I’m kinda at the point where I don’t look forward to the storyline anymore. The items rewards are just OK (I do better shopping at the auction hall; however the experience is pretty good) but the crazy unbalanced fights and every third mission or so just drags on forever in tedium kinda ruins the excitement. If you failed a mission on death (i.e. no restart from checkpoint), I’d have given up doing the storyline 30+ levels ago.